Disease didn’t take Thom’s grandfather – it was the Eua. Highwaymen didn’t try to kidnap him and murder his two best friends – it was the Eua. At first, Thom thought he must be losing his mind. To believe that conspirators from Earth’s powerful government would reach all the way to his tiny colony on Mars was laughable. Why would they? What could Thom or his grandfather possibly have that anyone in the Eua would want so desperately? Not even in his nightmares had Thom imagined a life where he and his two best friends would be on the run, pursued by those to whom killing was no sin, and mercy no virtue. After finding help from an unlikely source, Thom and his friends begin their search for the answers, and just maybe, a way to one day return home without putting their loved ones in danger. But what Thom discovers is a web of lies involving the bloody civil war that ravaged his planet a generation ago, corruption that extends all the way from Earth into his own government, and for reasons he can’t yet understand, his very existence. 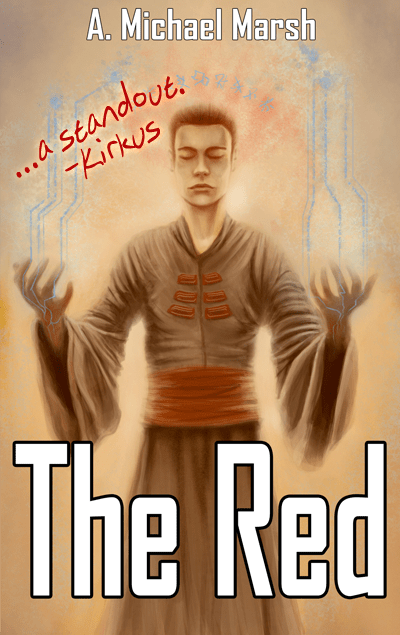 The Red is now available! It’s available in paperback, and as an ebook on all Kindle compatible devices. Check it out on Amazon – just click the image, above! I personally invite you to read the preview, and if you like what you see, I know you’ll love the rest of the story. Check out The Red on the sites below. There’s supplemental information about Thom’s world on the Shelfari page. It’s available in both paperback, and Kindle ebook from Amazon.